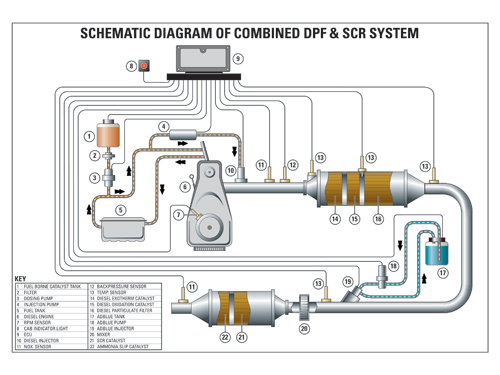 Where the maximum possible reduction in both diesel particulate matter and NOx is required, it is necessary to combine an SCR system with a diesel particulate filter (DPF). The DPF is usually upstream of the SCR system, and preferably both will need to be controlled by the same ECU. The main reason for this common control is that SCR systems can be damaged by excessive temperatures, which can occur during the regeneration of DPFs, therefore the DPF will need to be managed so that it regenerates in a way which does not lead to excessive temperatures. This normally means that the DPF will be regenerated more frequently so that there is less soot in it to burn. A second reason for common control is to do with diagnostics. For example, if exhaust backpressure exceeds a certain limit upstream of the DPF, this could be due to either a blocked DPF or a blocked SCR catalyst. If both systems are controlled by the same ECU, this should be able to diagnose the fault whereas if they were controlled separately it could be quite time consuming to do so. Blackthorn can supply complete retrofit DPF + SCR systems, as well as individual components for OEM applications. In addition we can service and repair existing systems.